Tongue Depressors are used as medical diagnostic instruments and are an important part of a physician's office. Tongue depressors are most often manufactured from wood and are disposable. Because our tongue depressors are made of wood, they are better for the environment than disposable plastic examination supplies. 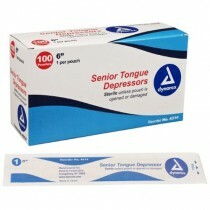 These tongue depressors are made of high-quality wood that is odorless and tasteless. Tongue depressors can also be used for spreading ointment and mixing medications. For other useful examination products, take a look at our selection of Protective Wear.